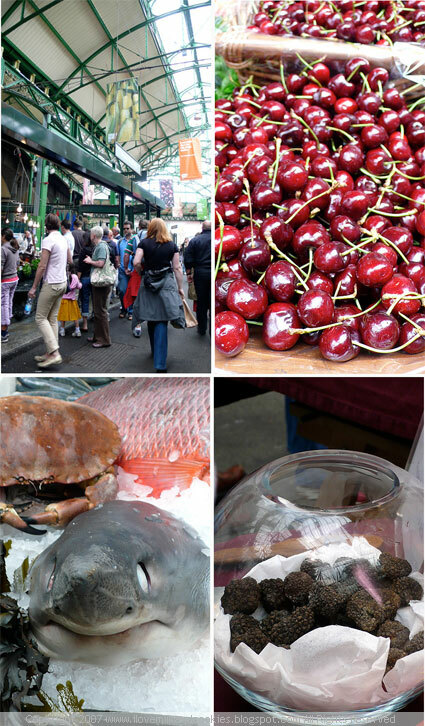 Borough Markets, London; cherries; yes indeed you are looking at a shark; an open bowl of truffles, the temptation! 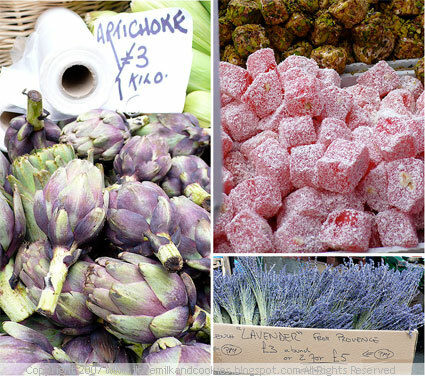 As promised here are the rest of the photos from London's renowned Borough Market's. There's a lot of things to catch your eye and it is quite simply a feast for the senses. As some of you have commented, these markets are a little pricey, but the great thing is, it doesn't cost anything to look around and try a few samples. Perfect snacking for poor tourists. Aside from the markets, there are a few cafes and shops just on its outskirts that are worth a look. I didn't really get a good chance to have a proper gander through them all but we did happen to stumble across a great little coffee shop called Monmouth Coffee. It's quite a rustic little cafe with a wooden communal table filled with all manner of bread, jams and breakfast condiments and an array of pastries on a adjacent table. The coffee was fairly cheap, about £2 and I don't normally drink coffee, as I'm caffeine sensitive, but GT seemed to give it two great big thumbs up. You know the kind that comes with a cheesy grin. Considering I didn't writhe in disgust as I normally do when I have coffee that's been burned, this place is a absolute winner. And if the queue is any indication of how good the coffee is, well, the line snakes all the way outside and around the corner in the mornings, so be prepared to wait for good coffee. But the great thing is that they are quite efficient and you actually don't wait for too long. Let's just say it's a welcome departure from the ubiquitous franchise coffee shops that seem to overrun London. We did also have the chocolate truffles from Monmouth, wow were they incredible. Aside from Monmouth, the equally famed Neal's Yard Dairy is just around the corner from the cafe and it is definitely worth going into the shop. From what I have read it seems like Neal's Yard was started by the same people responsible for Monmouth, so you know that the have a deep affinity with food and are interest in making good food. 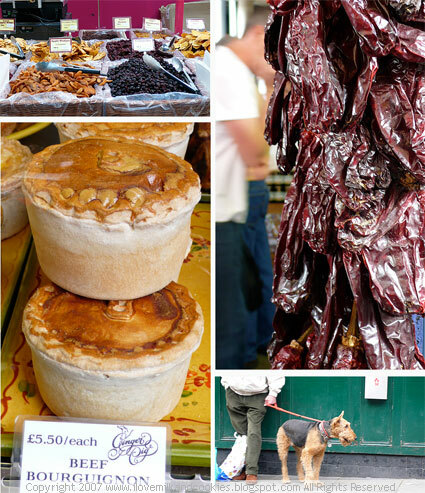 Well I hope this trip to markets has been a satisfying peek into the food culture of London. Much like you, I'm just discovering it for myself. I have noticed in general that Londoners love their sandwiches. I've never been anywhere, where there a several pre-made sandwich bars all metres away from each other. I guess the convenience is the main attraction, especially for those who have tight lunch breaks. But I must admit although sandwiches to me are a little blah, they are a much better and healthier option than say, Burger King or McDonald's if you need something in a hurry. So that's all for now, I have a whole stack of dishes I made in Sydney that I haven't had time to post, so there's no doubt you will be seeing them in the next few weeks. Man oh man, those markets are STUNNING!!! Love all the fresh berries and other produce, especially. I really enjoyed looking at your photos of the markets. Those berries look so divine. I could just imagine being there with all the sights, sounds and smells. 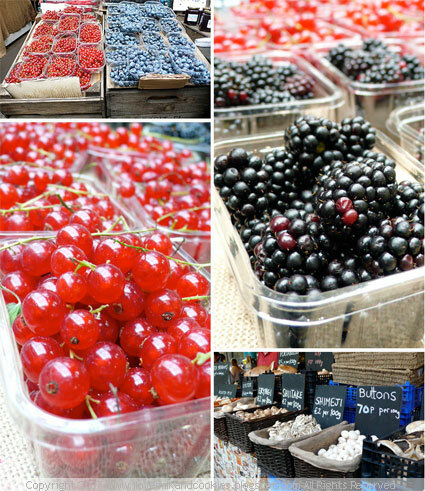 London's markets are stunning! I do have a soft little spot for those shortbread owls!!! Whoops I see you are familiar with Neal's Yard, at least the cheese store - if you haven't yet gone into the courtyard, it's quite a treat! shark head! i want an owl cookie. not a Scottish dog! it's an Airedale Terrier! i have one her name is Murphy. you're a wonderful photographer. Eh, why are you in London? Beatiful! (no speak english, sorry!). 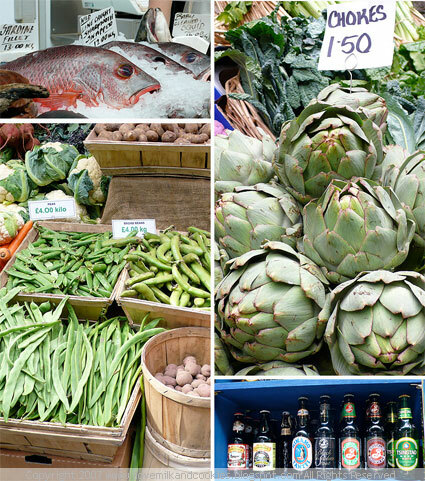 oh sigh and sigh some more, why dont we have markets like this everywhere here in Oz???? I want owl biccies ! wow the produce in the markets all look incredible! just check out the size of those artichokes! longtime reader, but first time poster because of the last lines. Yeah, when I lived in London, I was suprised by the love of sandwiches too. And I got kind of bored of them at lunch break, but not much other alternatives if you don't want to eat green salad only. Have fun, London is great to discover. I miss it sometimes. I have to take that eurostar back there for a weekend though! Borough Market is fabulous and I will make the trek just for Monmouth coffee and to gawp at those piles of truffles and brownies! Great photos. man oh man, those artichokes and the price! sigh they look so good! I love Borough Market. I have a daughter who lives in London and everytime I am there, we shop Borough Market. Monmouth Coffee is the best! Ooooh, the selections! Stunning photos - thanks for sharing. I love going to markets!! 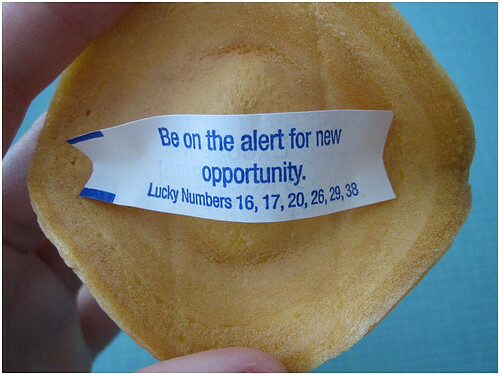 you never know what you will find! Wow, I wish there were a market like that were I live. Looks like so much fun! Great pictures! wow! have fun in UK! lovele shots of the local produce! I absolutely LOVE going to markets. You can find the freshest and most beautiful ingredients. how wonderful! i certainly hope to go to BM if i make it london again. you didn't miss much at pyrmont in sydney today...pouring rain and only a few stalls on the wooden pier open (all stalls on the grass area were sad and empty). What wonderful photos! I was smitten with all of them. I'm back in Sydney after six years in London - have a chocolate brownie from Flour Power for me! And don't knock the sandwiches. It is a weird concept when you first arrive but I miss being able to pop out and get a smoked salmon sandwich. 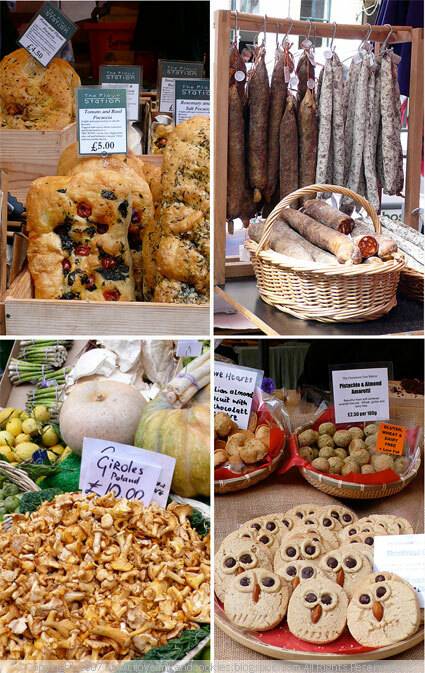 Your farmers markets look AMAZING!! You can't even compare them with ours in Florida, USA. 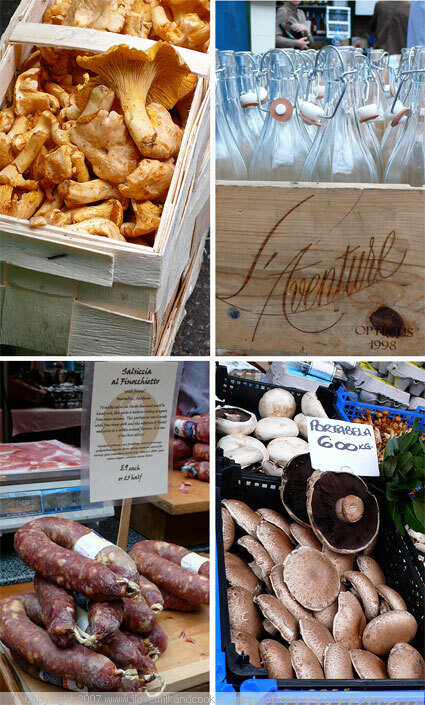 Great market photos. I love walking around markets all over the world and looking at produce!